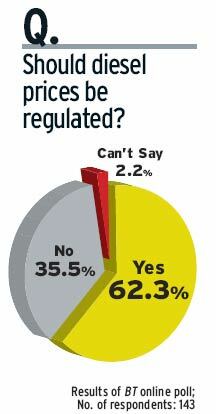 A majority of respondents is in favour of deregulating diesel prices, and understandably so. While petrol prices were deregulated last year, and have been hiked twice since then, diesel prices have more or less remained static. The government has been resisting calls for decontrol of diesel prices on the grounds that it will have an adverse effect on the farming community and stoke further infl ation. But this reluctance is adding to the air pollution due to the growing number of diesel-powered passenger and commercial vehicles. Besides, it is inadvertently subsidising the lifestyle of the rich with their penchant for fuel-guzzling SUVs that are invariably powered by cheap diesel.